DIE Mercurii, 6 die Februarii. Message from H. C. for a Conference about refusing them One concerning L. Mordant's Trial. Message from H. C. to return L. Abergaveny's Bill. Replevins and Avowries in Wales, &c. Bill. Edwardus Comes Manchest. Camerarius Hospitii. To desire a Conference, upon an Answer delivered to their Messengers who desired a Free Conference with their Lordships upon the Impeachment of the Lord Viscount Mordant. That their Lordships will take their Message into Consideration, and will send an Answer by Messengers of their own. 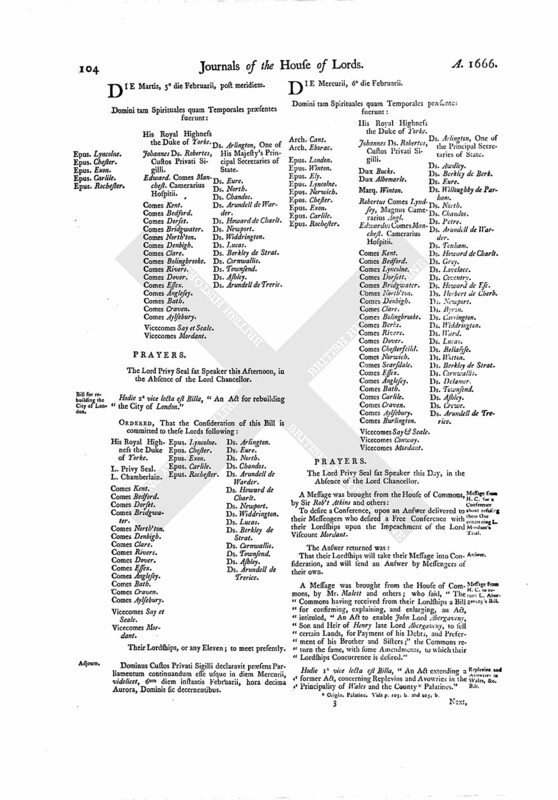 A Message was brought from the House of Commons, by Mr. Malett and others; who said, "The Commons having received from their Lordships a Bill for confirming, explaining, and enlarging, an Act, intituled, "An Act to enable John Lord Abergaveny, Son and Heir of Henry late Lord Abergaveny, to sell certain Lands, for Payment of his Debts, and Preferment of his Brother and Sisters;" the Commons return the same, with some Amendments, to which their Lordships Concurrence is desired." Hodie 1a vice lecta est Billa, "An Act extending a former Act, concerning Replevins and Avowries in the Principality of Wales and the County (fn. 1) "
Next, the Counsel and Witnesses were heard, at this Bar, according to the Order Yesterday, upon the Matters contained in the Bill depending in this House, for settling the Estate of the Lord Norris in Trustees, for the Benefit of the Lord Norris. 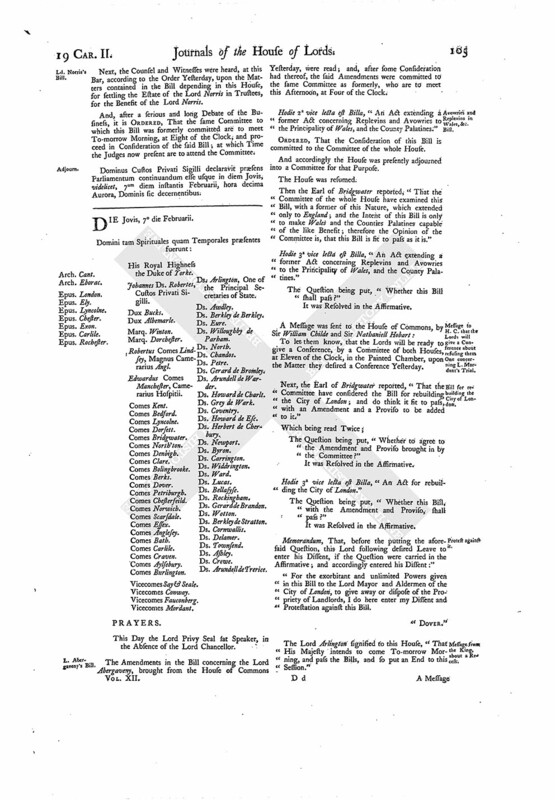 And, after a serious and long Debate of the Business, it is ORDERED, That the same Committee to which this Bill was formerly committed are to meet To-morrow Morning, at Eight of the Clock, and proceed in Consideration of the said Bill; at which Time the Judges now present are to attend the Committee. Dominus Custos Privati Sigilli declaravit præsens Parliamentum continuandum esse usque in diem Jovis, videlicet, 7um diem instantis Februarii, hora decima Aurora, Dominis sic decernentibus. 1. Origin. Palatine. Vide p. 103, b. and 105, b.